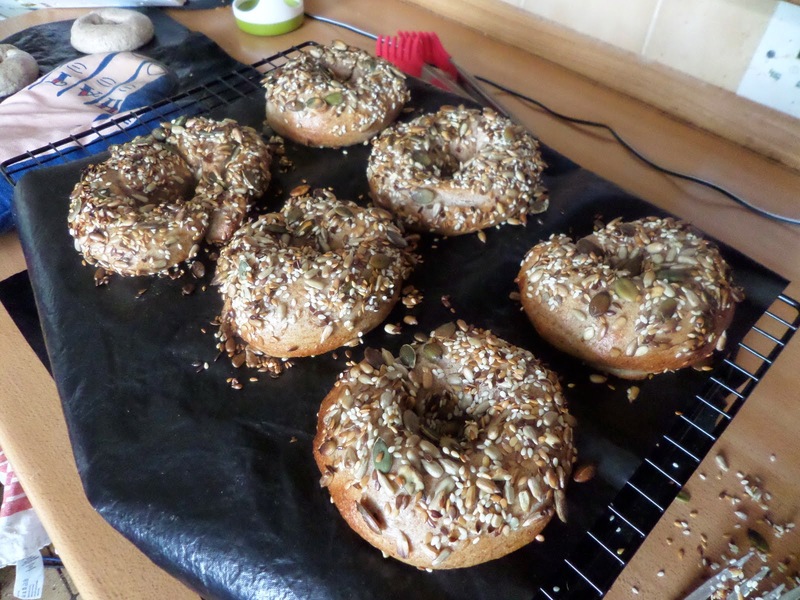 I’ve been meaning to try bagels for ages, and now I’ve found James Morton’s ecipe for sourdough bagels it’s clearly the time to try them. It starts with refreshing the dough as per normal. Mix everything but the salt and knead for 5 minutes, then add the salt and knead for another 5 minutes. Rise for an hour, stretch and fold, rise for another hour. Divide into 12 balls, roll out and make mini baguettes, then form them into a tight ring, pinching & rolling to seal. Proof for an hour. Set oven to max and preheat baking stone. Boil a large pot of water and add 5g of bicarb of soda per litre. 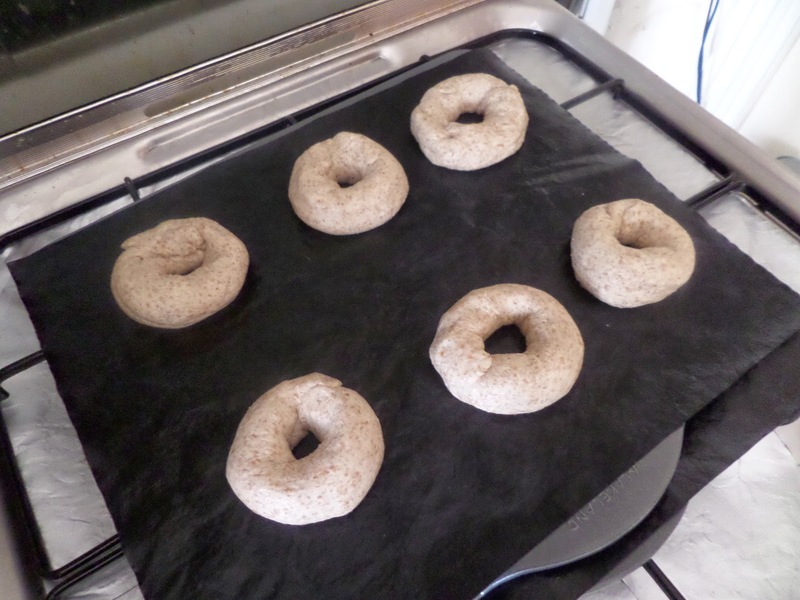 Boil each bagel for 30 seconds, flip, then 30 seconds on the other side. Remove with a slotted spoon and plunge into seeds to coat. The only problem with his recipe is how to bake them. It just says ‘fan oven for 10-13 minutes on preheated baking stone’, without giving a temperature! A quick look around the internet seems to say maximum temperature, so that’s what I’ll go for. As I want to use the baking stone I’ll bake in two batches of 6 each, using silicone baking sheets to make sliding on and off the baking stone easier. We’ll use the bagels in a couple of ways. 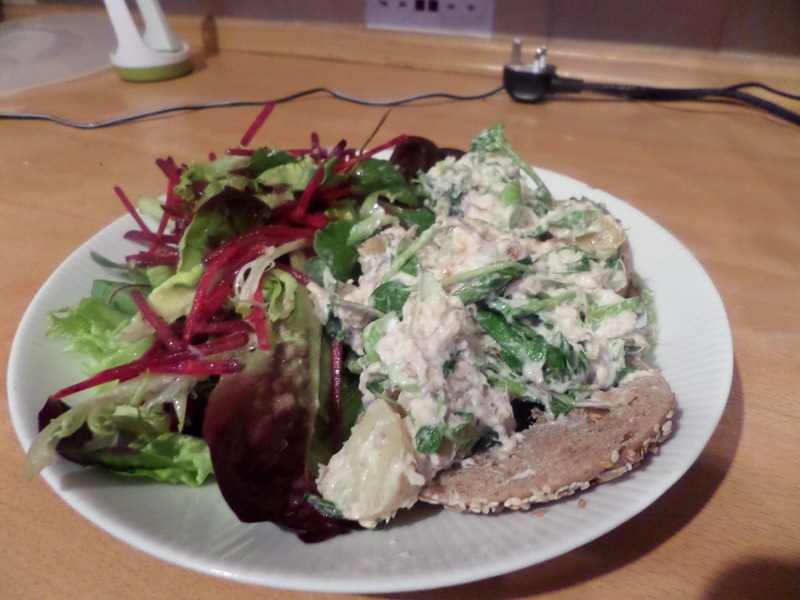 Firstly for dinner with a smoked mackerel salad. Then the next morning for breakfast with smoked salmon and cream cheese.